Steve Williams and son Matt’s true-life story appears over two pages in BEST magazine this week. 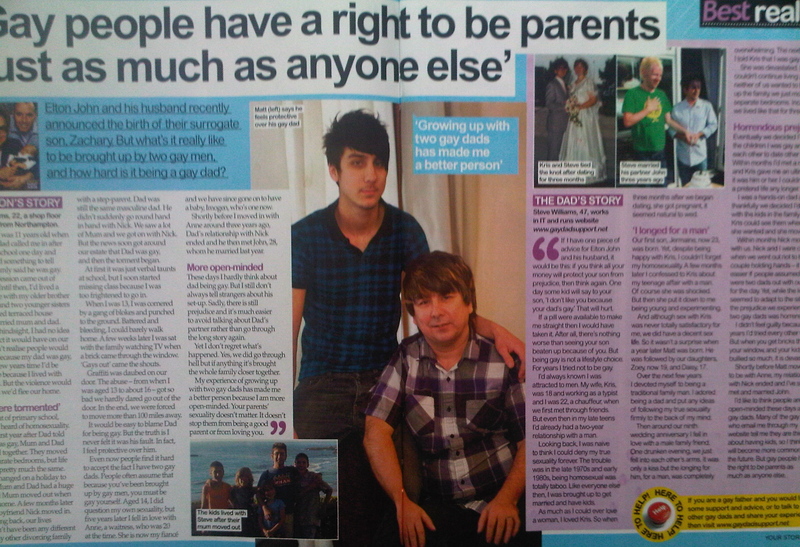 After their story appeared in the centre pages of The Sun newspaper last week, Steve and Matt’s real life story appears in Best, once again over a double page. I am pleased to report both Steve and Matt – who were very happy with the report in The Sun newspaper – were once again very pleased with the sensitive way their story was portrayed along with family photos. In fact the response from readers on The Sun website has been extremely positive as people read about the traumas the whole family have had to go through because dad Steve is gay. And I have had a number of people – interestingly, mostly heterosexual men – tell me how much they enjoyed reading this very honest account of growing up with a gay parent. I think this is because anyone can see from reading these stories just what a normal and close family they are. Real life story about growing up with two dads is printed in THE SUN newspaper today. Steve and Matt's story appeared in the centre pages. With the birth of Elton John and David Furnish’s son Zachary, this story in The Sun today is very topical. After all, what is it like to be a gay man bringing up a child and how is life for that child? Matt was just 11 when his dad Steve told him he was gay. Until then, Matt had lived with his married dad and mum and his three siblings. But shortly after dad Steve came out, the marriage ended. Matt’s mum moved out of the family home, and although Matt and his three siblings still saw her regularly, they remained with dad Steve. Meanwhile, Steve’s partner moved in. Suffice to say, life hasn’t been easy. The family were targeted by some who believed it was wrong for children to be brought up by two gay men and the abuse got so bad, at one point they were forced to move house. But, despite this, Matt, now 22 and living with his fiancee and baby daughter, speaks movingly of his relationship with his dad, whom he describes as someone who’s always been there for him and whom he can always go to for advice. And Steve, who runs a gay dads website, points out just because you’re gay does not mean you won’t want a family yourself and won’t be a good parent. That said, he does warn Elton and David that however much they try to protect their son, and however much money they have, there will be a time when Zachary will come up against prejudice because his parents are gay. However, gay parenting is definitely on the rise and is set to become more common in the future. Once, Steve was mostly giving advice to men who were already dads when they came out. But now he reports an upturn in enquiries to his website from gay male couples seeking advice on having their own families. Steve and Matt already have another deal through sell my story website Featureworld with a national women’s magazine.